I like the immediacy of Twitter, capturing and sharing joy (or frustration) when I get a book and want to say something about it, right away. If you want to follow me on Twitter, I'm @debreese. So here you go... tweets I sent out about Zetta's book! In my mailbox today! 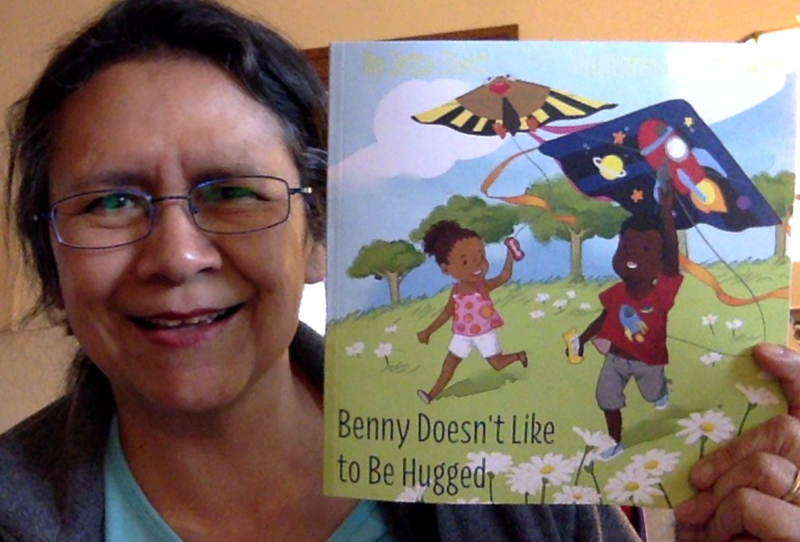 @zettaelliott's BENNY DOESN'T LIKE TO BE HUGGED. Zetta and I have lot of terrific conversations about children's lit, and some about institutional racism, too. I admire her a great deal. 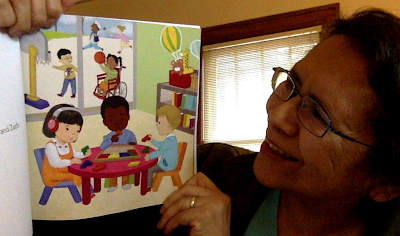 One time when we were talking -- online, I think -- I said that any of the kids in her picture books might be a Native child. I wasn't talking about that "culturally neutral" thing some people like. That is a bogus concept that I reject. What I meant was that a Native person's identity is not determined by dark hair/eyes/skin, or, ummm... cheekbones! Native identity is based on citizenship, or kinship relationships, in a specific tribal nation. We talked, then, about how a writer might signify or hint at a character's Native identity, in a picture book that isn't abt Native ppl. Where I ended was 'how about a t-shirt' that a Native kid might wear, one that shows that kid's pride in something Native. Zetta follows my work and knows I'm a huge fan of @arigonstarr's SUPER INDIAN. A few weeks ago, she wrote to me to ask about having Super Indian on the t-shirt. I was PSYCHED at that idea. I introduced her to Arigon. In my head, I was remembering working with Pueblo kids at Santa Clara. I showed them SUPER INDIAN. They love that bk. And, I had a Super Indian tote bag that @misskubelik gave me. It, too, was much-loved by them. ... any Native kid who happens to read this book and knows Super Indian... is gonna go WHOA!!! They're gonna say "LOOK!!! It is Super Indian!" Thanks, Zetta. I think this is way cool. As I sent out that series of tweets, two Native women--Chelsea Vowell and Adrienne Keene--who I admire tremendously for their work, too, were reading the tweets and then enthusiastically shared them with their followers. Repeating what I said on Twitter: this might look small to some people, but to me and the Native people who are sharing it on Twitter... it means a lot. Get a copy of Benny Doesn't Like to Be Hugged, and get Arigon Starr's Super Indian books, too!